Tagság kezdete: 2011. június 6. First Choice Web is an India based Company specializing in SEO Services such as traditional SEO, risk free SEO, Internet marketing, Local Optimization, Reputation Management services, Data Entry, Data Processing, Web design etc. We have more than 7 years of global experience and we are prepared to take on any project, no matter how complex or simple. Our mission is to provide the best back offices solutions available in the market today. We approach every project and every client with dedicated attention, and we carefully analyze the needs of the client organization and provide a solution that is designed to meet client expectations and requirements in a timely, affordable fashion. You will not find another service provider that is more flexible or responsive! Our Data Entry India services are efficient and accurate and our team is professional and dedicated to achieving the best results. Looking to work with you! We are an established indian SEO company with a history of delivering 1st page Google rankings for our customer base. 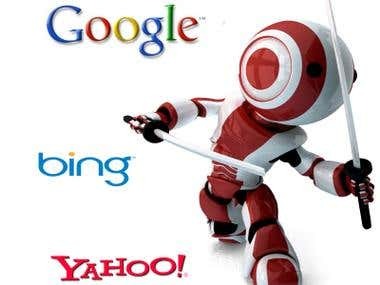 We have a 5 year experience in SEO. Credential is intended for graduating software engineers and entry-level software professionals. This publication covers post penguin anchor text case study to help your website rank high in Google.